There is a war being waged. For the ruthless and mysterious Channel, the objective is to unlock a treasure trove of extraordinarily advanced science and technology, holding promise of unlimited power and wealth. But the Channel must not win. At stake is the future of humankind. The possessor of the key must know the unknowable. 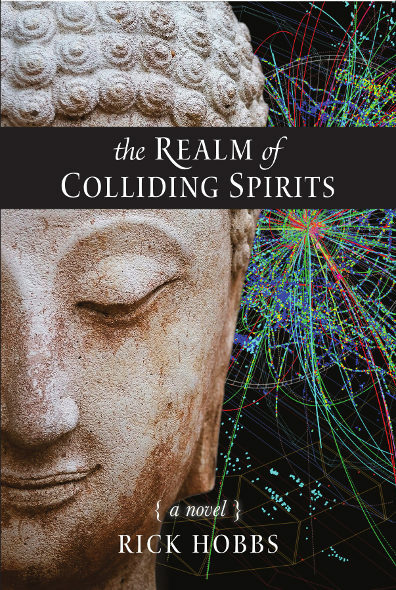 The Realm of Colliding Spirits is a journey of the mind, body, and spirit. It begins with cutting edge physics and leads to levels of higher consciousness— where the laws of physics coalesce with the spiritual truths of Tibetan Buddhism. Expect the unexpected, the unknown, the unexplained. Witness the subversion of science, the entrapment of scientists. Discover what it means to be human and, perhaps, what it means not to be. Question what is fiction and what is fact. Wonder who you are and from whence you came. But, never forget: The bottom line is love. Greed and lust for power subvert science and destroy lives in a worldly conflict with otherworldly dimensions. Gripping from page one. RICK HOBBS is a native of Georgia but in 1974 transplanted his roots (and his heart) to Maine. He has a BS and an MS in Physics from Georgia Tech and an MD from Emory University School of Medicine. Following medical school, he received his training in Family Medicine at the Maine-Dartmouth Family Medicine Residency. Later in life, he completed a year-long course in Medical Acupuncture at the University of Alberta. When he’s not engaged as practitioner or teacher, he loves being out under the stars doing astrophotography, sailing on Moosehead Lake, playing his fiddle, and studying Chinese. Rick lives in Waterville, Maine, with his wife, Elise, and their two dogs, Cozi and Tutte.